Sergeant First Class Tony "Ski" Wasielewski died earlier this month at home in Wisconsin. He had volunteered for Iraq as a veteran route clearance soldier, having already served a tour in Afghanistan. He was badly injured in an IED attack on May 15th, 2007, along with two other soldiers. He was well enough to attend welcome-home events for some of his soldiers, only to be felled by a blood clot in his heart. I know that at least one of the guys from Boise that knew and worked with him managed to make it to Wisconsin for the funeral; I neither really knew nor worked with him, but I know he will be sorely missed. Raise up your glasses for absent companions. The article is a series of four parts, chronicling the appearance of IEDs and how the often frantic efforts to counter them have finally moved "left of boom"- neutralizing IEDs and IED networks before the bombs send more young men home. I found a very interesting graphic on the article site: the snapshot "Iraq Hotspots" shows the IED activity in some of Iraq's hottest cities in May 2007. According to the numbers used to construct the graph, the only "hot city" where the find rate for IEDs was over 50% was Falluja. In Falluja in May 2007, the find rate was 85.2%. I have always bragged about the good work that we did in Iraq- this is a material indication of the kind of impact we made. Lest anyone think we had it easy out there- most IEDs in the Falluja region from March-April on were large (100lb+), deeply buried IEDs. Deep buried IEDs are the difficult to detect specialty of the Sunni insurgency, and they kill more American troops than all other types of IED save EFPs. No wonder the commandant of the Marine Corps wishes he had more route clearance! The article is quite thorough in discussing the various high-tech approaches the military has taken to minimize the IED threat. In Parts 2&3, there is an extensive discussion on electromagnetic countermeasures (ECMs, or simply "jammers"), in which the author notes the complexity of maintaining the multiple distinct systems used in Iraq. Adding to the complexity that the author mentions is the fact that certain types of jammers wreaked havoc on certain other types. The problem was a nuisance at best- at worst, a passing patrol could burn out the incompatible jammers on another patrol and leave the second team vulnerable to radio-controlled IEDs. Such situations were not common, but they did exist- perhaps such troubles are a natural by-product of the rush to field new equipment. In war, the battlefield becomes the testing ground as disparate systems are thrown together in an attempt to make something work. The author covers nearly every portion of the IED fight of which I am aware, with one glaring exception- route clearance. He relates that the human eye and the soldier behind it is "more adept at finding bombs than any machine", but does not follow the thought through to the logical conclusion- make teams of soldiers to hunt IEDs, arm them with specialized equipment, and turn them loose. This lapse is not one that I blame him for- the military is notoriously close-mouthed about route clearance assets. In the past two years, I know of three articles written about route clearance: two were in the military newspaper Stars and Stripes, and another was in some other soldier's publication. None were informative. I understand the need for secrecy, for preventing the enemy from knowing our strategy and tactics, but this is ridiculous. While we were in theater, our enemy was circulating videotapes detailing what they thought we did and how they thought best to kill us. Every Iraqi can stand by the corner and watch us pull an IED from the ground. Route clearance units are no secret to them. Here, back home, almost no one knows that anyone does or can do what we spent a year doing. I still get emails with words to the effect of "It's so great what you are doing! I never knew we could even find IEDs; I thought you just drove and hoped not to get blown up." That represents a criminal lapse. The Washington Post article makes the point that IEDs have more strategic impact than tactical. Commanders and troops see an IED just like a sniper- a battlefield threat to be minimized and then accepted. Mothers and politicians, however, see a rampant killer. Terrorists see an impotent occupier. In that kind of strategic environment, it is a crime to allow the enemy to think that there is nothing we can do to stop them. A Gooseberry Wheat beer, to be exact, brewed by Scottish monks. Strange, but tasty. I've also stopped smoking (actually, I stopped the day I stepped onto the plane in Kuwait), and haven't craved a smoke yet. I've gotten used to wearing my seatbelt and using my turn signals again, and I've almost stopped reacting to debris/cracks/etc in the road. 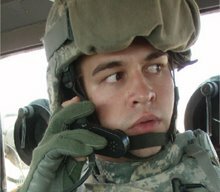 I still miss Iraq, though, and if it weren't for my knowledge of how life goes on without you during deployment, I'd volunteer to go again. Once in a while, I'll find myself back there while I teeter on the brink of sleep- I'm getting ready for a mission, or taking fire from that two-story building that the command wire runs to and wishing I could see which window its coming from. Those moments don't happen all that often, though, and I'm starting to immerse myself in normal life again. I will be attending the BlogWorld Expo, held on November 8-9 down in Las Vegas. One of the featured events will be the awarding of the 2007 Weblog Awards, for which nominations are now open. According to the link tracker, this blog has already been submitted under the "Best Military Blog" and "Best of the Top 3501-5000 Blogs". Take a look over there, and submit a blog or two. You can also "plus up" a nomination, thus seconding the nomination and making it more likely to become a finalist. There's many excellent blogs over there to choose from. Speaking of excellent blogs and bloggers, the upcoming book from The Sandbox is due out soon. Keep an eye out for it- I've had a bit of a glimpse inside, and it is well worth the wait. Bill Roggio reported from Iraq on the spread of tribal movements similar to the Anbar Awakening. He touches on the story from Baghdad province- similar things are happening in Salad al Din and Diyala provinces, to the northwest and northeast. In Diyala, the tribal council includes 80% of the major tribes, and involves Sunni, Shia and Kurds. I wrote shortly before I left Kuwait about the murder of Sheik Sattar, the leader and primary founder of the tribal movement in al-Anbar province. His brother has stepped up into the role, while US Special Forces captured his murderer. Violence was widely expected to rise during the holy month of Ramadan, both because of past trends towards violence and because of al-Qaeda / AQI affiliate warnings of a "Ramadan Offensive". In fact, Reuters reports that violence over the first three weeks of Ramadan is around 40% lower then it was last year. As a cautionary note, the last week is considered especially holy for martyrs, and we may therefore see a spike in violence over the next few days. Another recent post- Dead Eyes- received a weekly writing award from The Watchers Council. will soon be available alongside many other excellent bits of writing in the upcoming book The Sandbox. Invisible Keepsakes has been updated with three new posts, and more will be forthcoming. I've been home for five days now, and I'm mainly occupying myself with beer drinking and lazing around. It's strange to have to contend with the realities of an "ordinary" life- making sure the bills are paid, looking for a new car, buckling up to ride in the car, getting my own mail, etc etc. I looked through some of my pictures and video with a couple friends tonight and felt what I can only describe as homesickness. I'll get over it, I'm sure. I'm tired already of hearing the same questions from people: "So what's it like? "- you might as well ask an astronaut about the moon. The other standbys of "So are we winning? ", "Did you kill anyone?" and "So how bad is it, really?" aren't any better. I realize that such questions reveal what is in many cases an honest desire to understand, but I still find it irritating to answer them over and over. Selfish and irrational, I know. I'm back, and ignorance and curiosity are in full swing. Please, never ask a soldier if they killed anyone. It's a pointless question, because the ones that have won't want to tell you, and the ones that haven't will be only too happy to spin you a tale that means less than nothing.